Looking for a tough, heat tolerant turf? How about Buffalo Grass? You may have heard of it, but have you actually seen a buffalo grass lawn? If not, you might want to seek one out. If you’re looking for a natural yet contemporary look for your landscape, you should consider growing a buffalo grass lawn. This is a true native grass of North Texas. It used to grow extensively from South Texas all the way to the Panhandle and supported the buffalo as they roamed across the plains. If it can handle buffalo traffic, you can be sure it can handle your pets and kids! 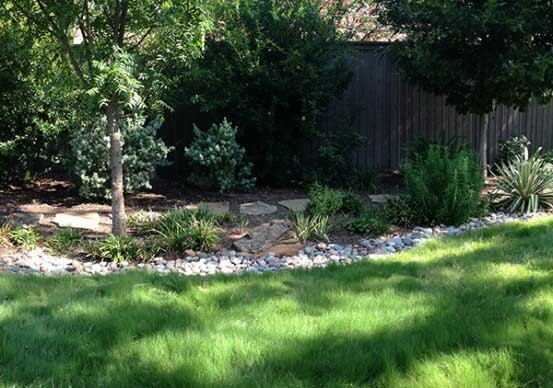 Looking for a lawn that can really take the heat and drought we experience here in North Texas? Buffalo grass fits the bill. Not only does it use less water and hold up to the heat, it’s also highly resistant to many of the pests and diseases that plague Bermuda and St. Augustine lawns. Buffalo grass is a smart, eco-friendly and sustainable choice for our Texas climate and soils. Buffalo grass is an especially great option if you don’t want to mow very often. You also shouldn’t mow it low. Mow it to a height of 3 to 4 inches to remove the slender male flower stalks that rise above the leaves if you don’t like their appearance. That should be done only once per month at the most. But realize, the more you mow it, the more you’ll have to water it. The benefit of buffalo grass as an eco-friendly lawn choice is that left to grow to it’s natural height, it only needs irrigation once per month and only needs mowing a few times per year. Once established, buffalo grass sports bright green to blue-green fine-textured blades that have a wispy appearance. When left to grow it it’s natural mature height, it creates quite a beautiful effect in the landscape. However, it won’t look like a manicured golf green! You’ll have to change your expectation of what a “lawn” looks like when you transition over to buffalo grass. Planting Seed: Since this is a warm season grass, it will need 70 degree days for seeds to germinate. Plant after first frost in mid-March and keep seeds moist until they germinate. Once they germinate, they’ll produce runners after about four weeks. Seed four pounds per 1000 square feet for a lush lawn. Before seeding, prep soil with a layer of compost. As always you want your soil to be as healthy as possible to ensure a good start. Establishing Sod: We recommend sodding in fall. It’s always easier to establish new roots through our mild winter than through our extreme summer. Prepare your soil with compost and added nutrients then lay down your sod. It will need water daily to become established. If you need help installing new sod, we can recommend reputable installers. Healthy soil will produce the best results. Our year round Soil Building program is a great way to ensure your buffalo lawn stays healthy and strong to withstand Texas heat, pests and disease.